Our first flowers of spring have appeared. Everyday I like walking through the garden, taking a look at the progress made by our plants. I snapped these photos yesterday. 2. Oregon grape: A native. I know this is not a picture of the flower, but look at that color! 3. One of our plum trees: I'm hoping the other two are going to bloom soon. Otherwise, no plums. 4. Red Flowering Currant: Another lovely native. I can't wait until our red flowering currants are mature. I've spotted a few around town and they're spectacular this time of year. 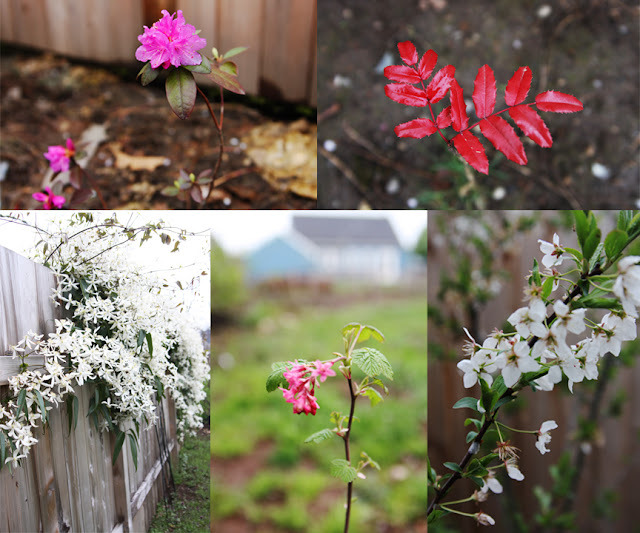 What do you have blooming in your garden now? Let's face it, sometimes being able to identify every plant in our garden is tricky. I've found it really helpful to place a label with newly planted material, which can be expensive if you purchase labels specifically for this purpose. I don't remember where I first heard this tip, but I tucked it away in my brain until I took a trip to the Rebuilding Center, a nonprofit warehouse that houses materials in need of reusing or repurposing. I was in search of old aluminum blinds and I was in luck! All you do is take apart the blinds, cut them to the size you'd like, and write on them with a permanent marker. Last year I had issues with the writing fading in the sun, so I'd suggest placing the labels facing the direction that gets the least sun in your garden. I've made a ton of labels. See the sea of them below, keeping our water-loving plugs company. Lots of blue and yellow-eyed grass and Oregon iris. Have you ever been caught in the following dilemma? "Oops. I forgot I planted <insert non-evergreen perennial here> in this spot and planted <insert another plant here> too close to it." Take the dozen or so Western bleeding hearts (Dicentra formosa) I placed around the garden last spring. I didn't label them and when the foliage disappeared during the winter, I forgot exactly where I'd planted them. And then I started putting in new plants probably too close to the bleeding hearts. 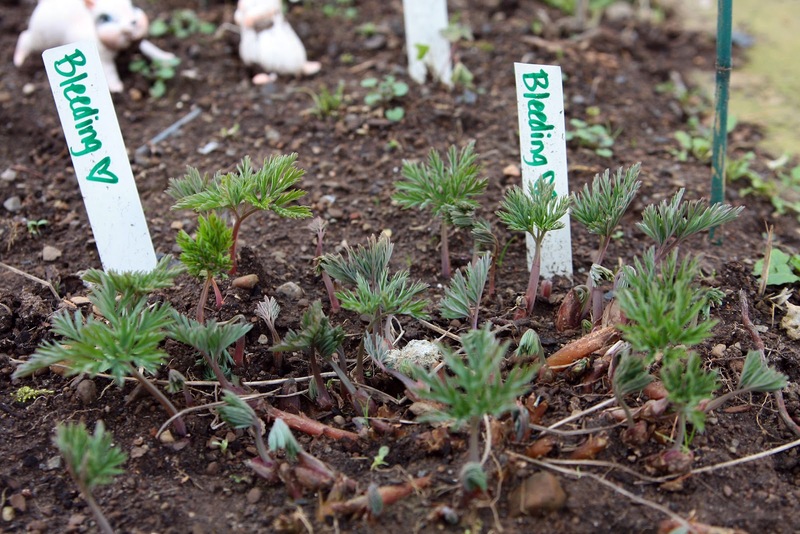 Now I'm taking advantage of the bleeding hearts' re-emergence to label their locations in the garden to avoid this in the future. Oh it'll be so exciting when they're in their full, lovely glory! And I'll remember to expect more Douglas Meadowfoam in this spot next year. Ack! I have a horrible, kale-munching, collards-crunching pest in my vegetable garden. Please don't judge the horrible, neglected condition of my veggie garden! Sure, he looks like an innocent grass-muncher in this photo, but you can be sure Andy jumped the fence to chew on some greens as soon as my back was turned. A perimeter reinforcement is in order before our new veggie babes get tucked into their beds.